Sports science student Ujah ran opening leg in incredible win at World Athletics Championships. Middlesex student Sam Hazel also won gold for Britain in 4x400 relay at European U23 Championships. In an amazing month for Middlesex University athletes, CJ Ujah has won a gold medal as part of the men’s 4x100m relay team at the World Athletics Championships and Sam Hazel has won gold in the men's 4x400m relay at the European U23 Championships. 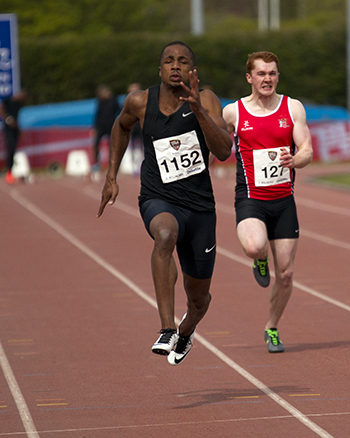 Ujah (pictured running in the BUCS Championships) and teammates Danny Talbot, Adam Gemili and Nethaneel Mitchell-Blake held off the USA team – who were favourites to win – on the finish line. "This is the most fantastic feeling," BSc Strength and Conditioning student Ujah said afterwards. "We knew we could do it, but when we did it, we did it with a bang. “I'm proud of these guys, we work so hard, including the team behind us at British Athletics, and it's just crazy to do it in London, our home town." The race also marked the end of legendary sprinter Usain Bolt’s illustrious career as he retires from international athletics. Ujah won the men’s 100m race at the British Universities and Colleges Sport championships last year, setting a new record of 10.17 seconds in the process. In 2014 he became the youngest Briton and only the fifth ever to break the iconic 10-second barrier with a personal best of 9.96 seconds. 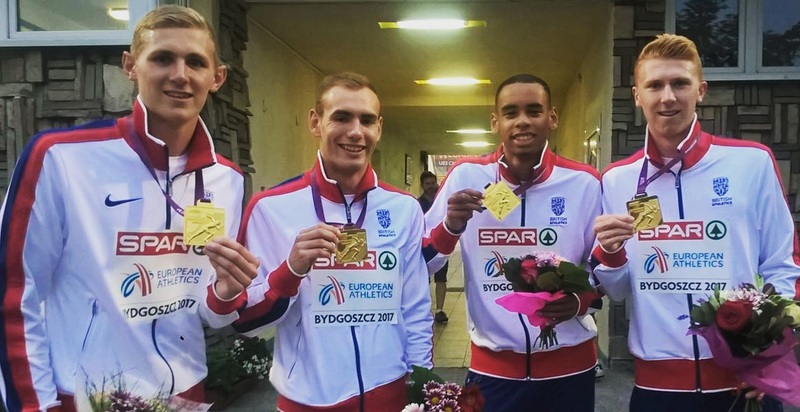 Another sports science student Sam Hazel won a gold medal for Britain at the recent European U23 Championships. Sam and his teammates triumphed at the competition in Poland with a time of 3:03.65 minutes, beating the French and Polish teams over the finish line. “'As it was my first time representing GB, I really didn't have big expectations,” says Sam. “I just wanted to enjoy the whole experience and hopefully get a chance to run. I ran in the heats and was pleased with my performance and once one of my teammates felt a little injury, I was put into the team. “I knew we had a great 4x400 team but to win gold was amazing." Sam has received some help from Middlesex during his training and represented the University at the recent British Universities and Colleges Sport Championships.